Seventy years ago, in 1945, the Japanese fascists had been attacked by the Chinese people and the allied forces from the United States, Soviet Union and other countries in the world, finally Japan announced to surrender unconditionally. 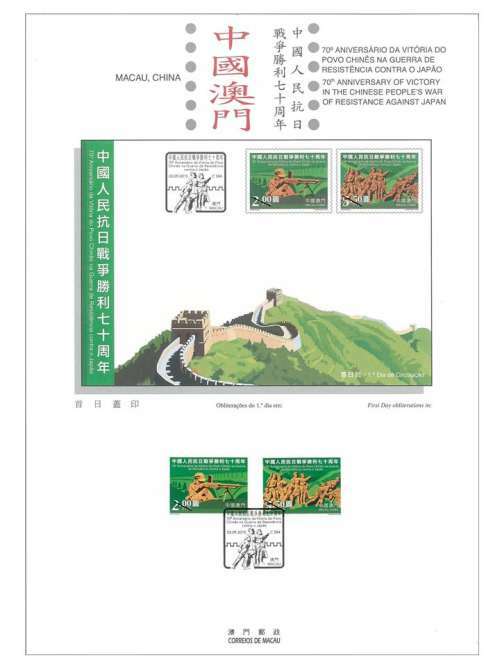 The victory in the War of Resistance Against Japan has turned a new chapter in the Chinese history of defeating foreign invasion, contributing substantively to the victory of the world’s anti-fascist war. 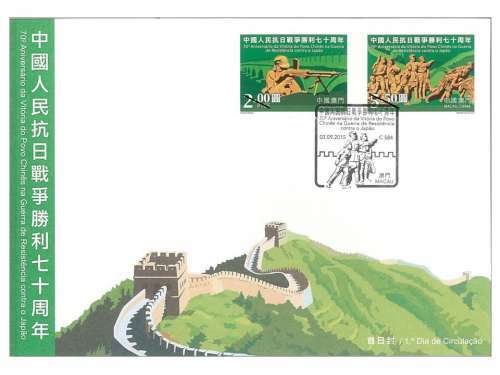 Macao Post will issue the stamp theme “70th Anniversary of Victory in the Chinese People’s War of Resistance Against Japan” on 3rd September, 2015, this issue includes a set of two stamps, illustrating the heroic posture of the Chinese people against the invaders. 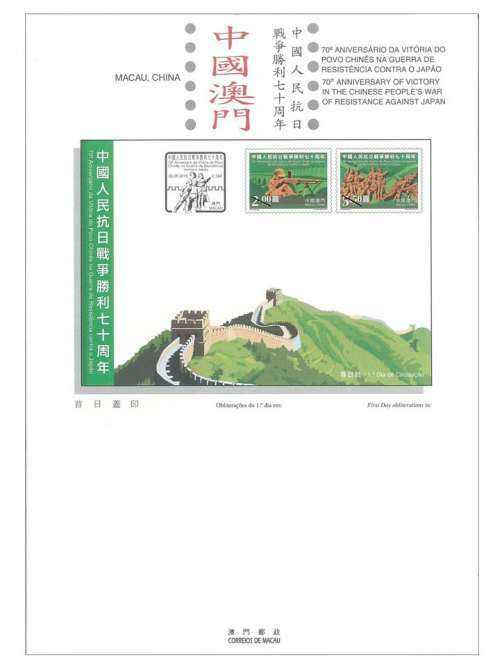 The stamp designer for this issue is Mr. Ao Kuan Kin, and the text of the information brochure is written by Mr. Yin Degang. This is the twelfth issue in 2015. 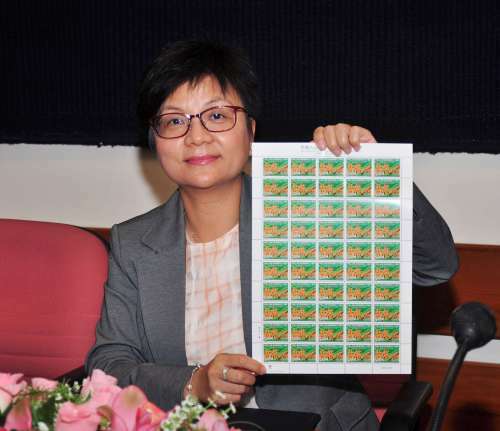 The previous issued stamps are “Lunar Year of the Goat” on 05/01/2015, the label stamp “Lunar Year of the Goat” on 28/01/2015, “110th Anniversary of Rotary International” on 16/02/2015, “Mainland Scenery VI” on 01/03/2015, “25 Years of AICEP” on 27/04/2015, “Macao Wetlands” on 05/05/2015, “110th Anniversary of the Birth of Xian Xinghai” on 13/06/2015, the label stamp “Old Streets and Alleys” on 30/06/2015, “150th Anniversary of Guia Lighthouse” on 08/07/2015, “10th Anniversary of the Historic Centre of Macao as World Heritage” on 15/07/2015 and “Water and Life” on 31/07/2015. 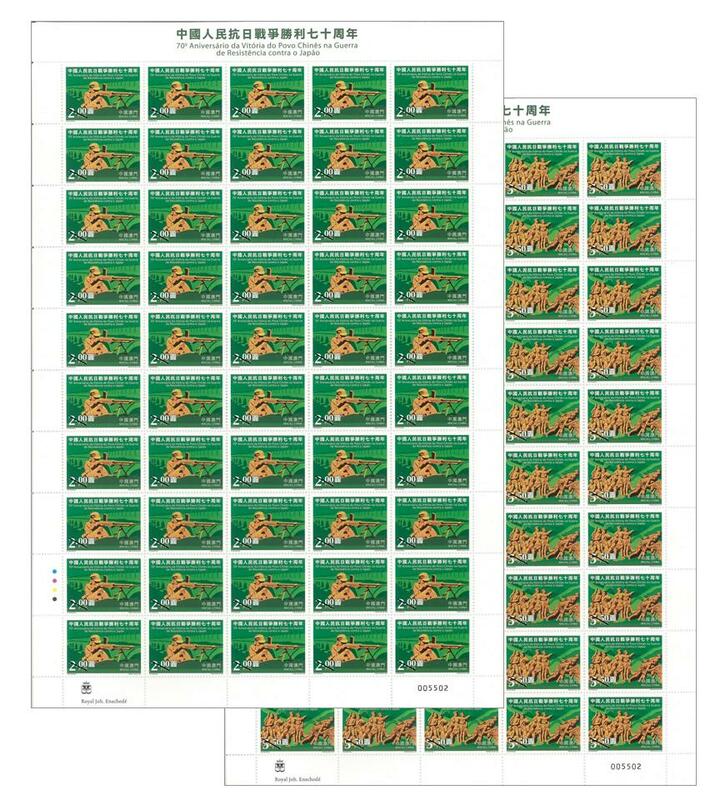 Technical Data of Stamp "70th Anniversary of Victory in the Chinese People’s War of Resistance Against Japan"